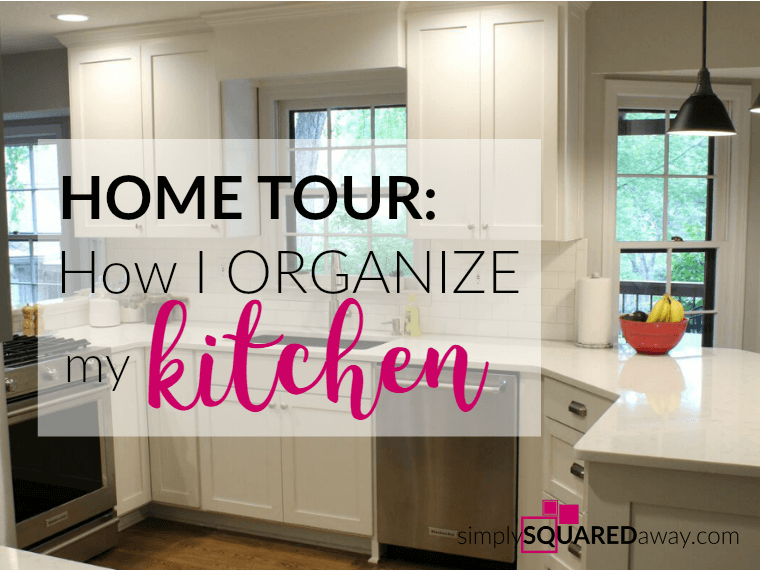 Home Tour: How I Organize My Kitchen. 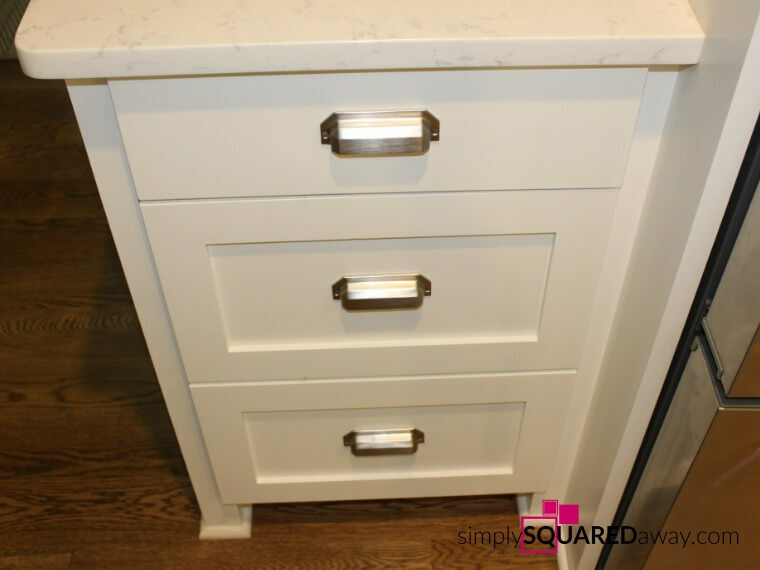 See inside every cabinet and drawer! 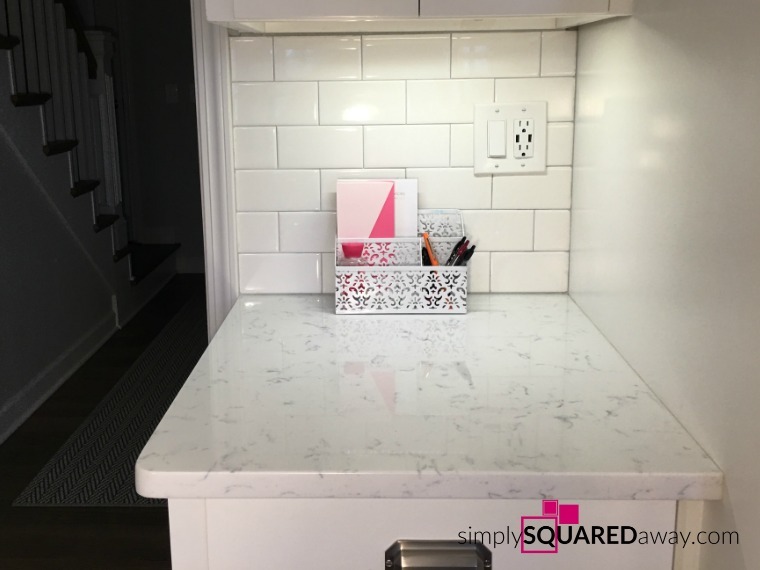 I am starting a Home Tour on my blog! 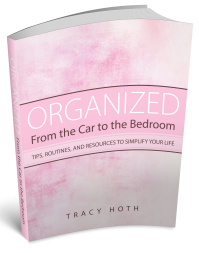 I am going to open up my home to show how I organize my spaces. 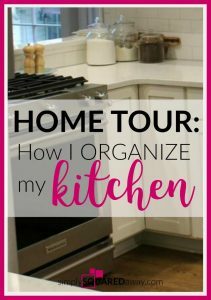 I’m starting with how I organize my kitchen. 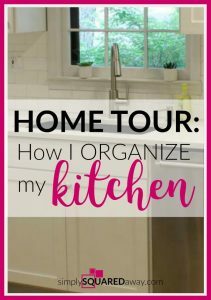 Throughout the tour, I’ll share the organizing products I use, challenges I have, things I’m getting rid of, etc. 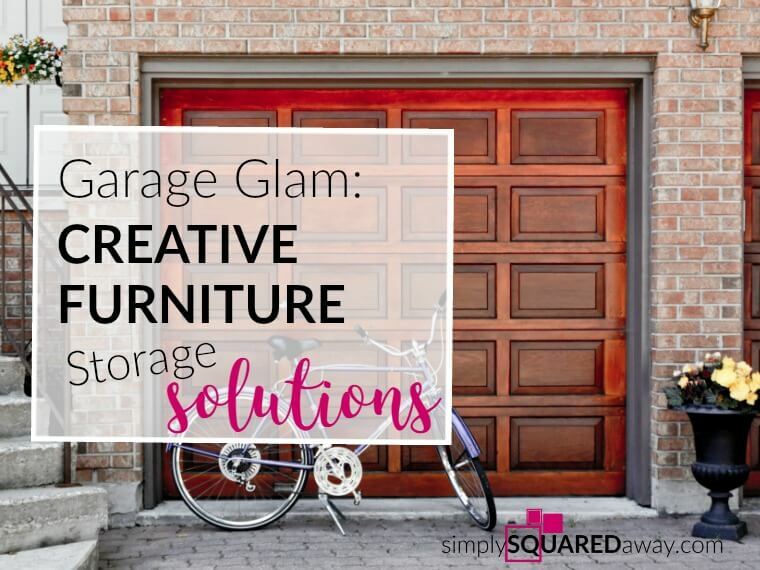 Hopefully this will help motivate and inspire you AND help me purge more things and organize every space in my home. We had been wanting to do some work in our home for quite a while. Our house was built in 1978. We still had linoleum in it from the 1980’s. Every couple years I would strip the whole kitchen and dining room floor by hand with this chemical floor stripper and then rewax the whole thing. 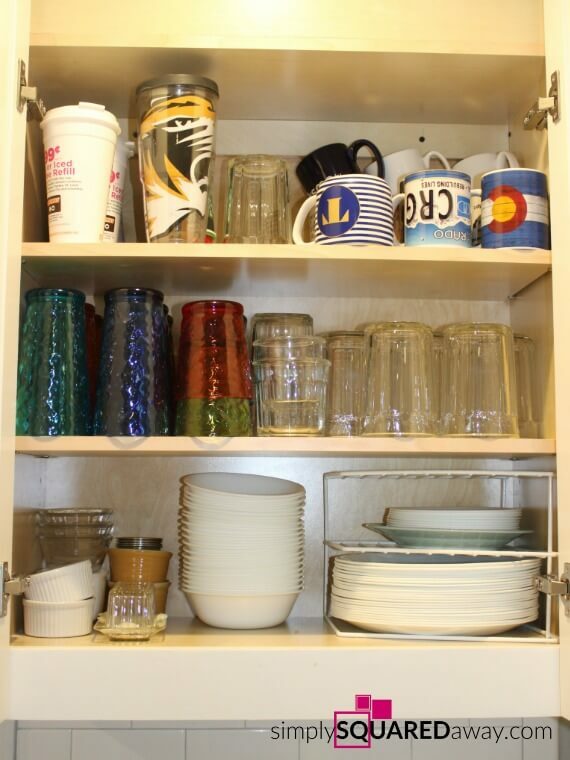 The previous owners had the jugs in the cabinet or I would never have known what to do. I don’t know what I was thinking. It was so much work! But, it looked amazing when I finished. I always wore knee pads but the last time, after being on my knees for a few hours, my right knee started hurting. When I took off the knee pad I had a huge, raw, open wound. The result was a very large, permanent scar. I told myself I would never strip the floor again. The reason we hadn’t remodeled was because when I thought about one thing to do (like paint) it was tied to the next thing. If we did the floors what would we do with the trim? That ties into the walls. We still had some wall paper that would need to come down. The windows were the old windows with the same reddish wood trim. It was a nightmare to think about. And, expensive. Finally, after having a designer (recommended by a friend) come in, we decided to make some changes. She told us to focus on the paint and the floors. We got an estimate from the painters to scrape the popcorn ceilings, spray and paint them, paint all the walls on the main level (which included smoothing textured walls in the living room and mending all the walls where I took down the chair rail in two rooms and the lower half wall paper in one room) and paint ALL the trim on the main level including 14 big windows with the older, individual wood panes. Then, we got the estimate to put hardwoods on the entire main level. No more carpet. It was time to strip the floors again and since I was never doing that again we had the painters begin the process. 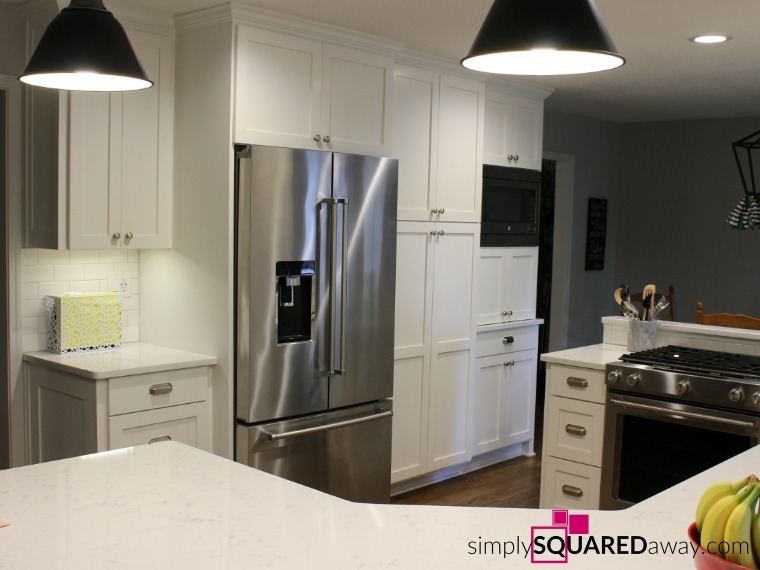 In order to paint the ceilings in the kitchen they took the upper cabinet doors off because we had soffits that had a lip that needed to match to the ceiling. Since the doors were off I thought it would be a good time 🙂 to get an estimate to replace just the cabinet doors. The cabinet guy told me that the doors were the most expensive part and I wouldn’t be happy with the cabinets if we just replaced the doors. 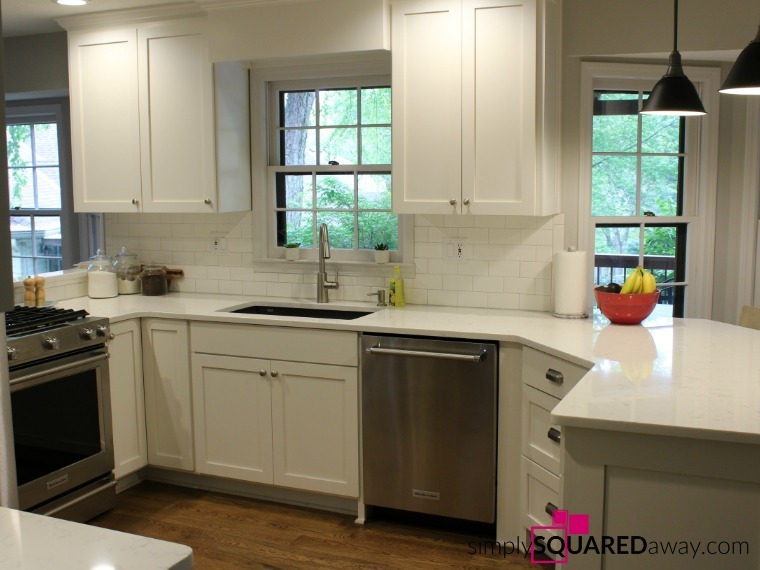 Our cabinets were the kind that had a 3-4 inch piece of wood down the middle of the cabinet. 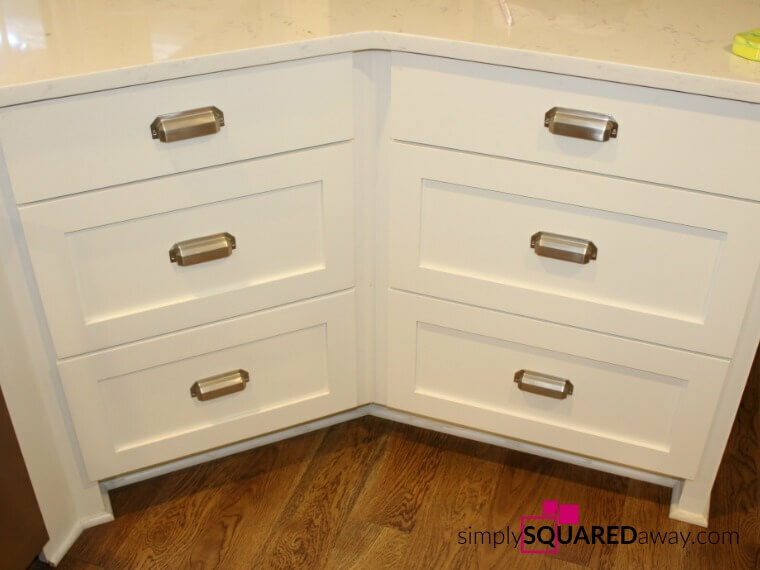 The cabinet’s wood grain would be visible even if we painted them to match the doors. He also told us to take out our soffits. Agh! Now we HAD to make a decision about the soffits before they could go any further with the ceilings. It seemed crazy to get the ceilings all redone now and then in two years decide to take the soffits down and try to match up the exposed part. Why not do it all right now and only live in a mess once? Then, we’d be able to enjoy it. We decided to just do it all now. 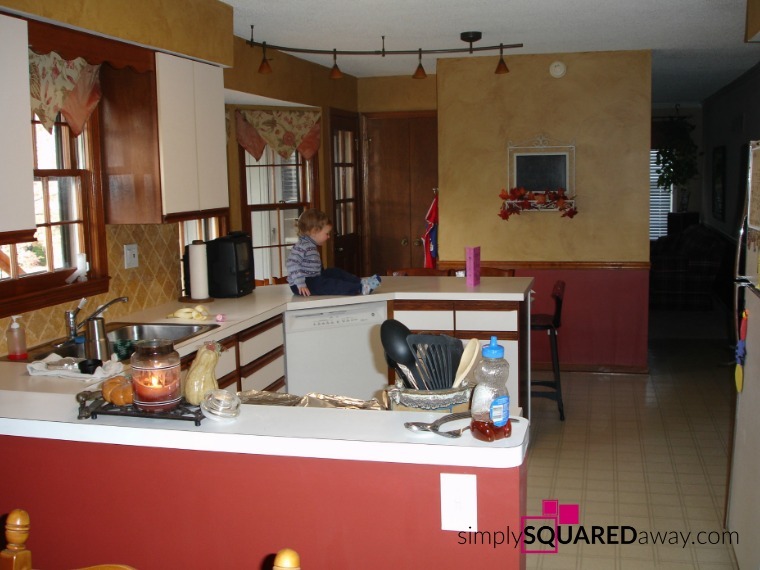 I found these unstaged (obviously, with a child sitting on the counter) old kitchen photos. Definitely unstaged with a raw chicken on the stove. Lol. 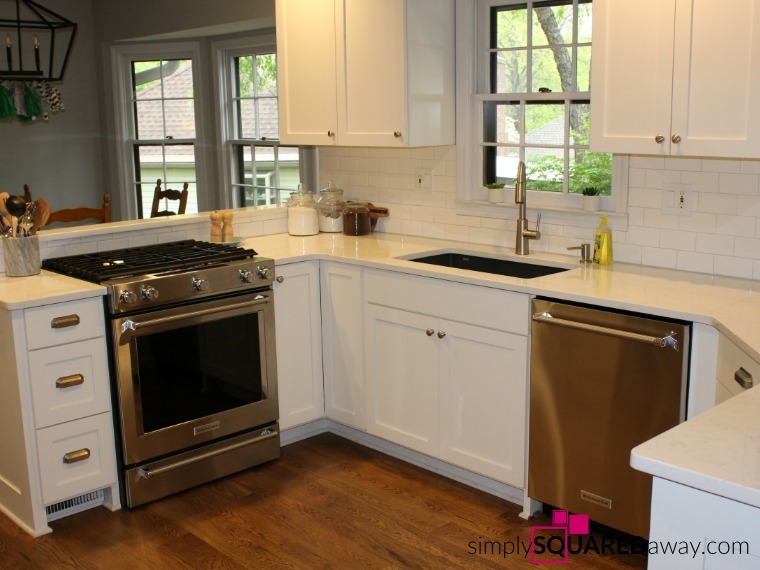 Here is the kitchen after the remodel. Most of the walls are still bare. 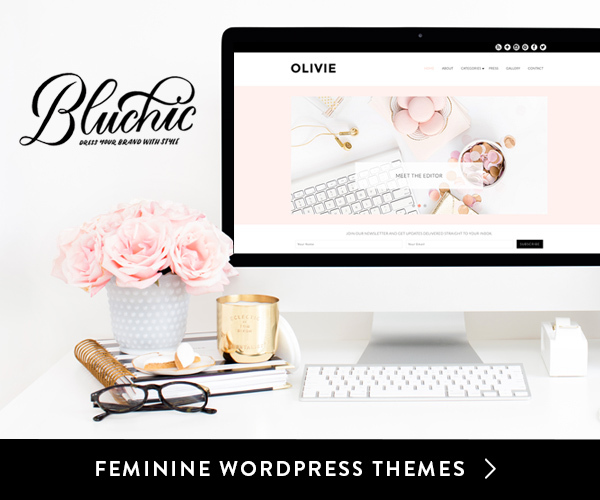 Partly because I am enjoying how clean and simple it is and partly because I don’t know what I want to do. During the remodel I went through every single item in my kitchen. I tried to get rid of as much as I could. I donated at least 2 full boxes before packing everything. While unpacking and setting up the kitchen I donated at least one more box and gave away some family glasses. 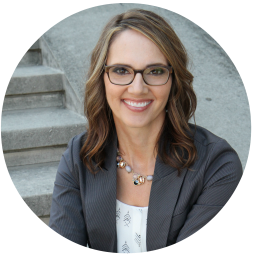 I have included links below to kitchen and organizing products for your convenience. Some are affiliate links. You can read my full disclosure here. These are the 6 drawers on the bar and to the right of the dishwasher. Starting on the top left drawer and moving left to right like you’re reading a book. I used this to organize it. It fits perfectly and looks custom. This one is similar and I love that it is adjustable. 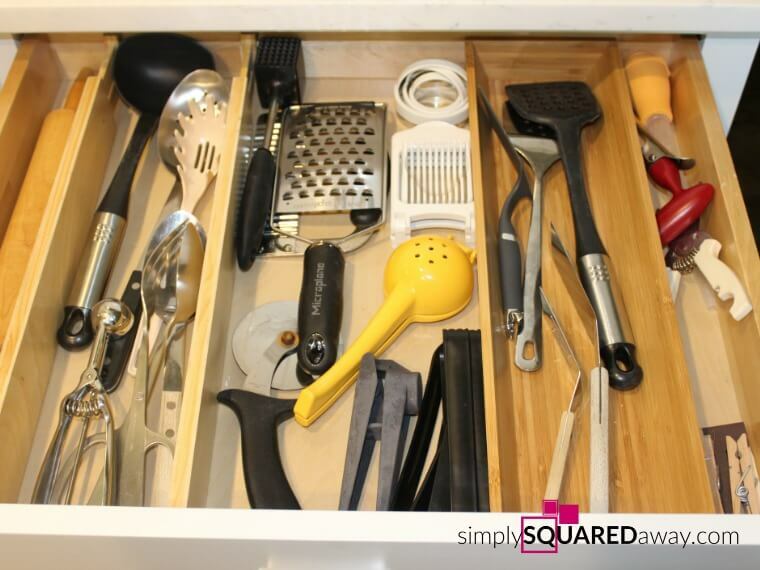 Things I use often like measuring cups and spoons, spatulas, etc are in this drawer. I used this to organize it. My favorite drawer of all…the plastic wraps and baggies. 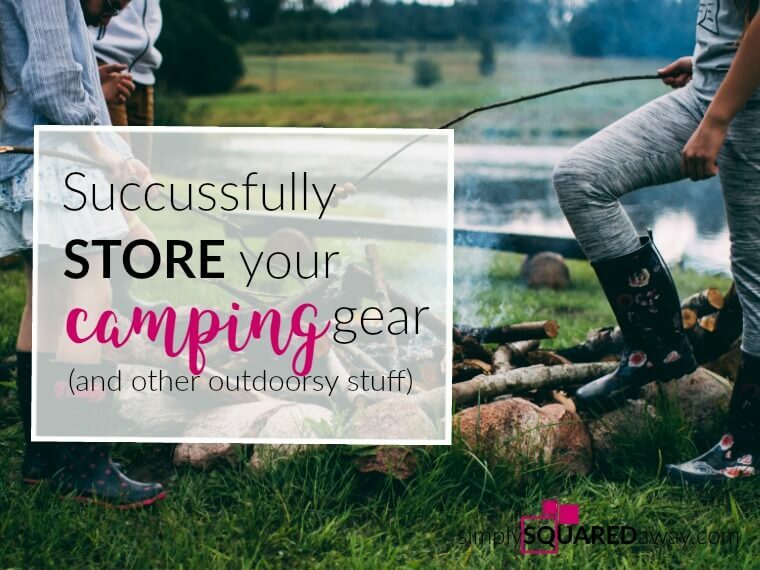 Everything is in one place. I use parchment paper a lot for sheet pan meals. It used to be in the bottom, back of the pantry but now it is so easy to grab. I didn’t need an organizer because they fit perfectly. 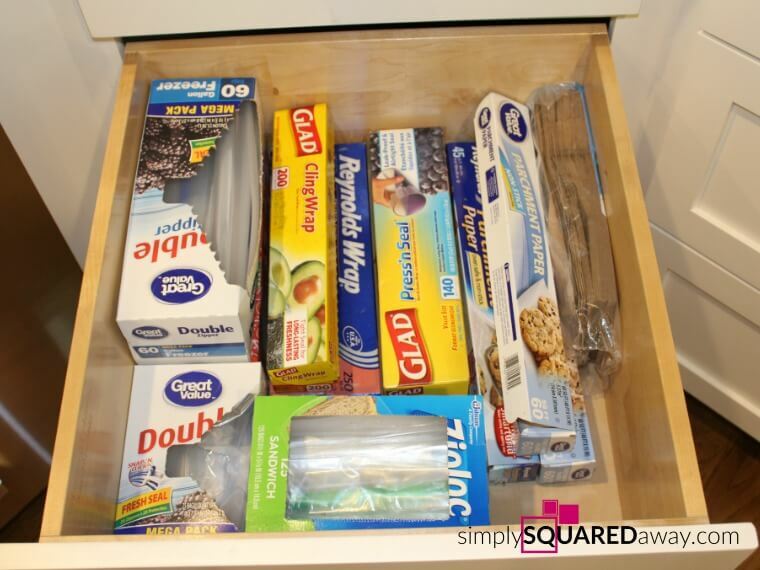 Here are more options for organizing these items if you don’t have a drawer like this. 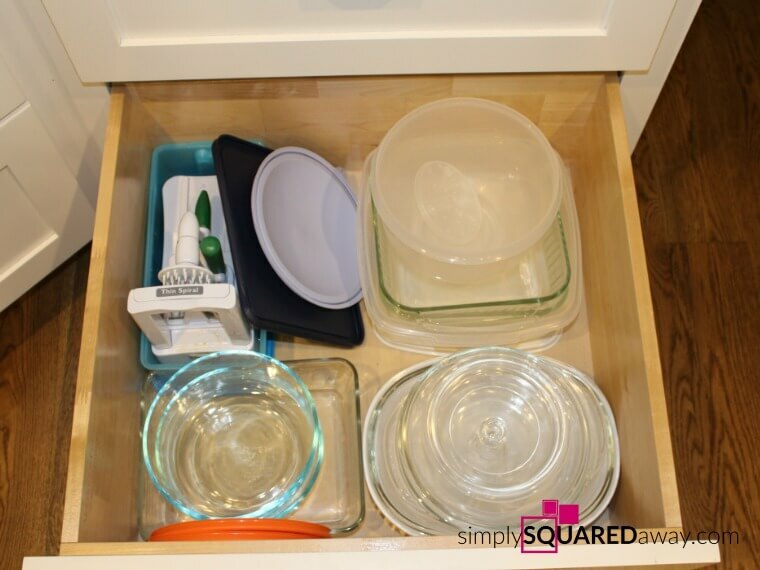 These glass containers are what I’m transitioning to for food storage. 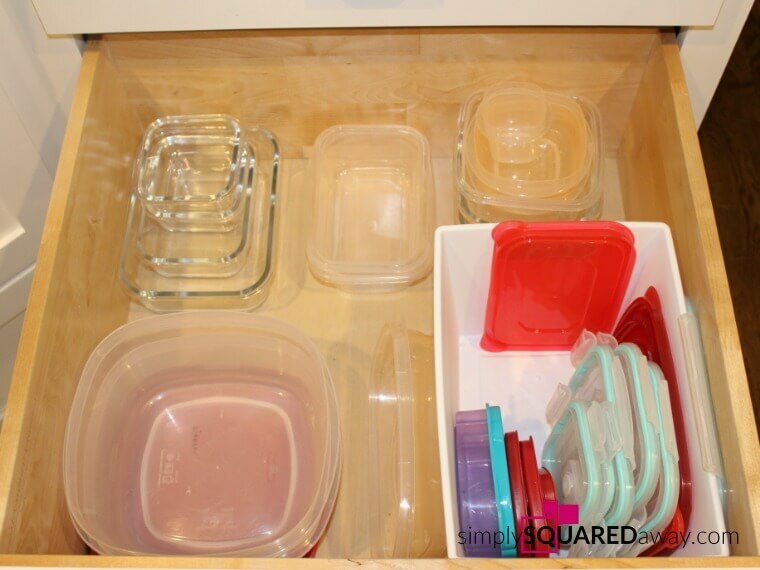 I had a lot of leftovers in the refrigerator so there are more containers that fit in the drawer. The white bin is from the dollar store and holds the lids. I love these colored bowls. The red one is on our counter with fruit in it. This pyrex measuring bowl was the best wedding present ever and has been used at least a billion times! I’ve had this hand mixer since I’ve been married (1995) and it’s getting old and weak. I have never owned a stand mixer but did get this Ninja system with a food processor and smoothie cups a few years ago and love it for blending cookie dough, making smoothies, shredding carrots, etc. 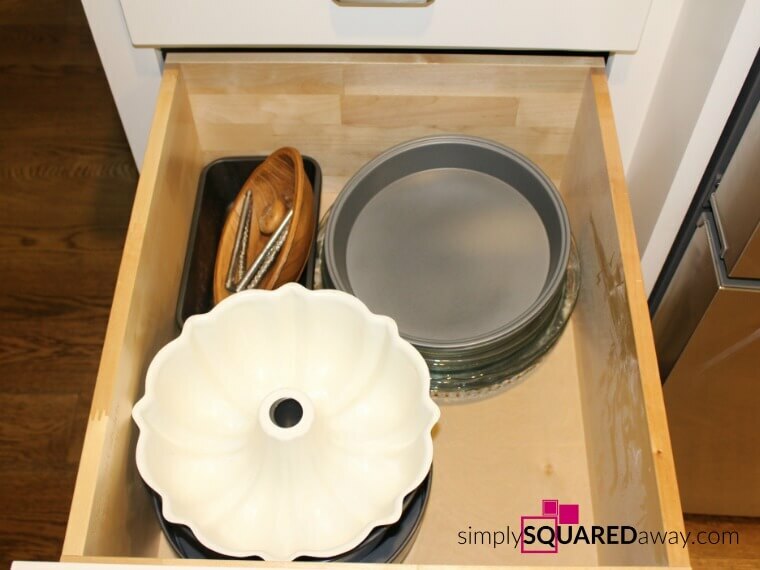 Baking dishes, larger food storage containers and my spiralizer (love it and highly recommend) fit well in this drawer. We are loving the colored glasses from Sam’s Club. I’ve always used these plates and love them. I bought two sets and now buy extra plates and bowls individually. 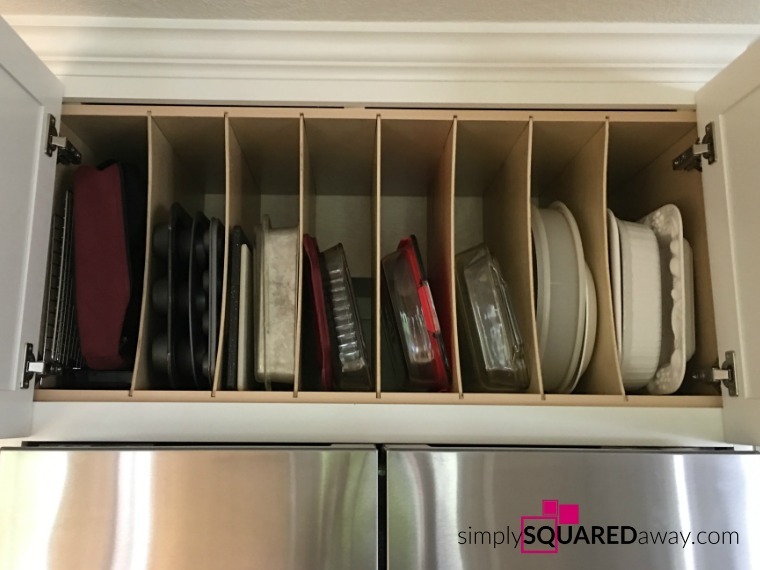 They all fit on the one shelf using a shelf organizer like this. My daughter gave me this new turquoise one for Christmas! Our towels can get so nasty so quickly. We finally bought some new ones with a gift certificate we had at Macy’s. Under the back, white towels are some trivets and on the right is my drying mat. I threw away all my wash cloths a long time ago and use only a sponge in the sink and a spray bottle of vinegar and water with a microfiber cloth on the countertops. I only kept three tablecloths with some matching cloth napkins. 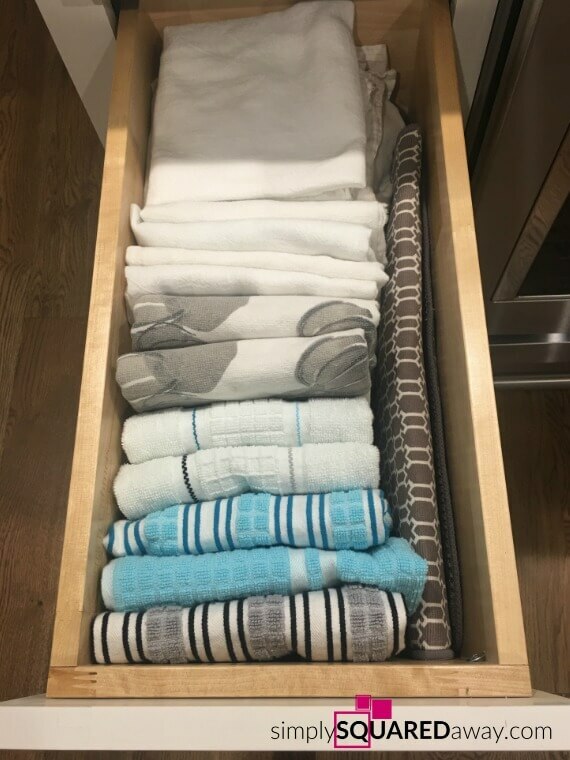 These old towels were put in this drawer but since I haven’t used them yet I need to move them out to the rag bin in the garage. Do people still register for china when they get married? I’ve kept mine and am glad I picked a neutral pattern. My grandma gave each grandchild a set of this stemware for their high school graduation gift. The cream and sugar set is from Chad’s grandma and the fancy tea cups are from my other grandma. These spice organizers are working great for me but I cannot find them anywhere to include a link. Here are other options. I bought them at Sam’s Club on clearance last winter. My daughter and I went through every single spice and got the basic spices down to 40. We relabeled them and put them all in alphabetical order. It is thrilling. The white basket on the top holds refills for spices that we put in baggies. 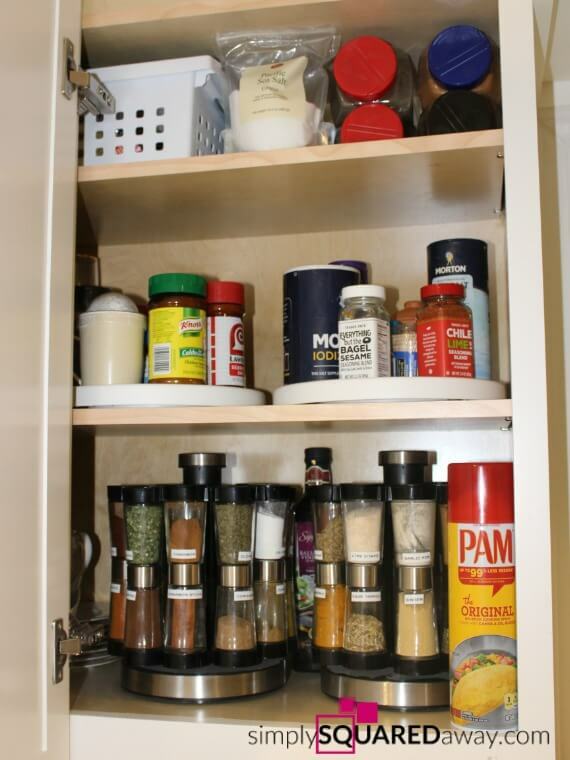 There are also a few huge spice containers up there. I am going to try and buy smaller quantities so they stay fresh. The lazy susans hold random other specialty blends, fresh garlic, a powdered sugar sifter, etc. 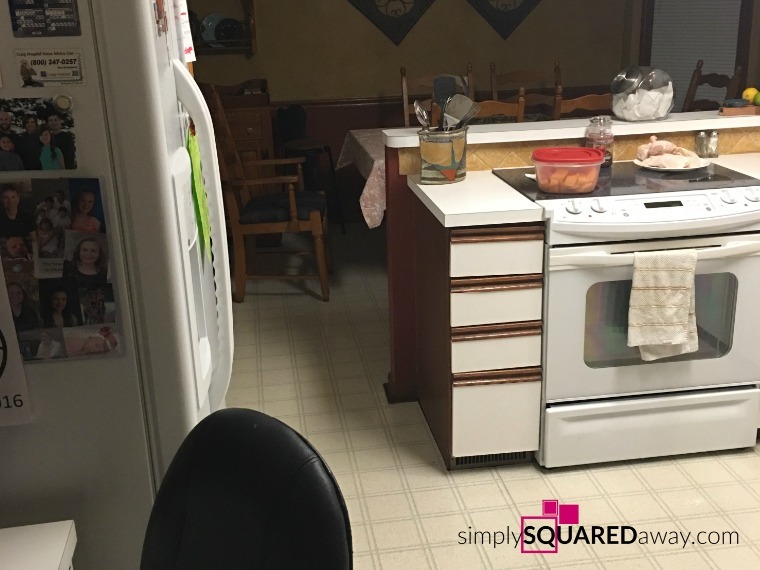 To the right of the stove is our lazy susan cabinet where I keep the pans, crockpot, strainers, and wok. I like keeping the lids with the pans. 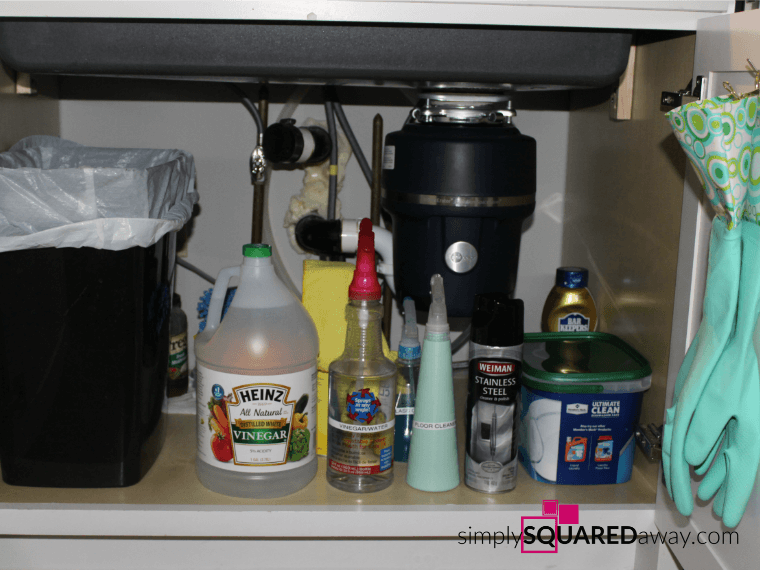 I keep our trash can, spray cleaners that I use all the time (vinegar/water, Bona floor cleaner, Windex, Pledge and stainless steel cleaner) and the dishwasher pods under the sink. I used these hooks to hang the gloves on the door. I’m trying to use gloves more when cleaning dishes. The sink and disposal are huge so there isn’t a lot of room but I do have a small bin of sponges in the back right and my grease jar (Prego jar) behind the trash can. What do you all use for grease? The cabinet to the left of the refrigerator is where we keep medicines. I’ve tried to eliminate as much as possible. I have found it works best for me to keep the two supplements I take (this magnesium and calcium) in my bathroom so I remember to take them before bed. 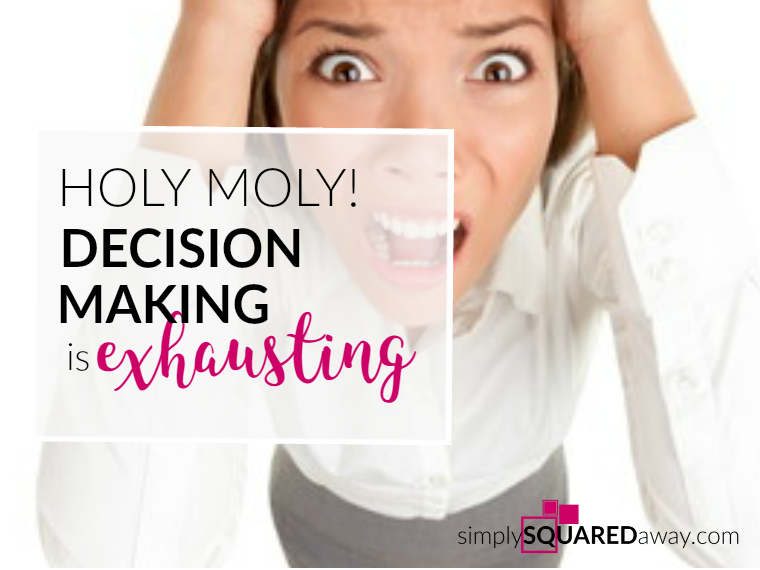 I started taking Magnesium because my jaw hurt when I woke up (clenching it?). Taking magnesium works and it helps me sleep better. I’ve read that most of us are deficient. 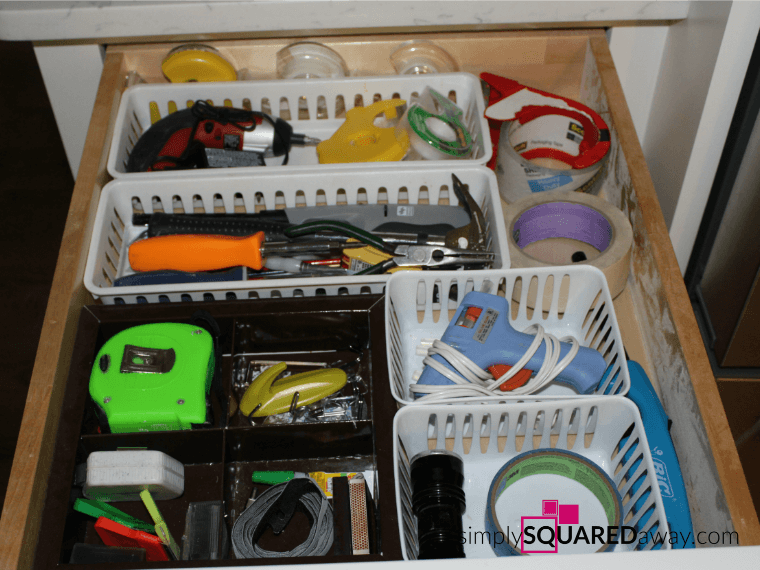 I’ve used this style drawer organizer for years. My 18 year old son just commented yesterday that we have always had our nail clippers in the same drawer. The Crystal Light container is where we put pocket change. Organizing tip: Adjust the height of your shelves. These recipe binders didn’t fit anywhere else in the kitchen so I raised the shelf and now they fit perfectly. Under this cabinet is a set of three drawers. I used dollar store organizing bins and a leftover box to organize everything here. This drawer holds round baking pans and the nut cracker that was my grandparents (good memories). I haven’t used any of this in the new kitchen and it’s been three months. Maybe I need to bake more? 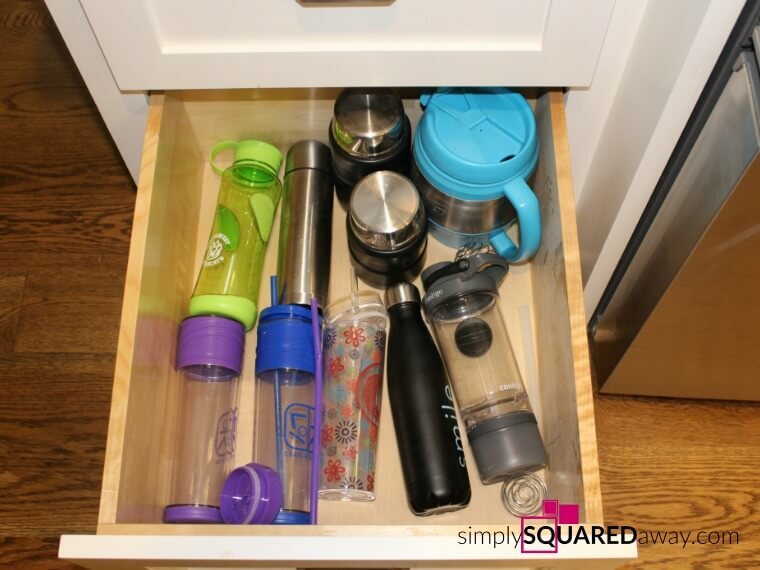 The bottom drawer is another favorite – water bottles and thermoses. I love just putting them in the drawer. They don’t tumble out or fall over. A few were not in the drawer because we were using but we got rid of so many. I told the kids they could keep two or three each. I can’t believe how many we have gotten just in the last three months – college visit, internship, birthday, etc. 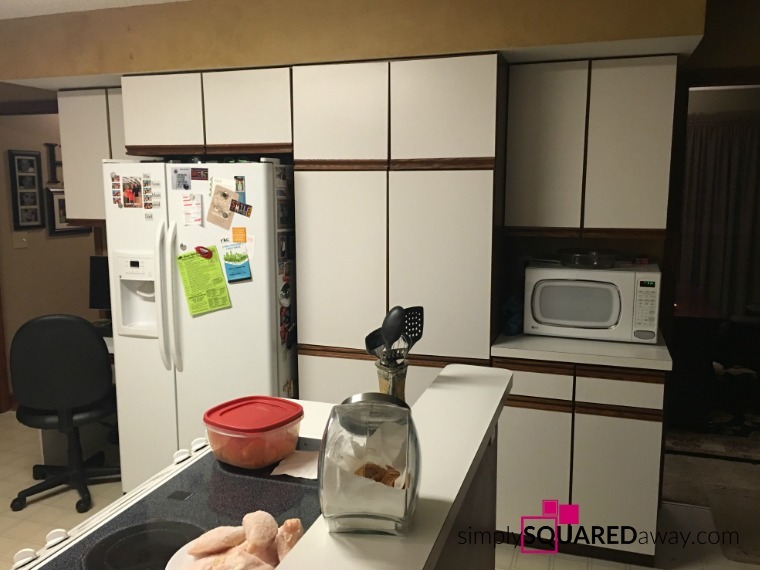 To the right of the refrigerator is the pantry. We have 5 drawers. 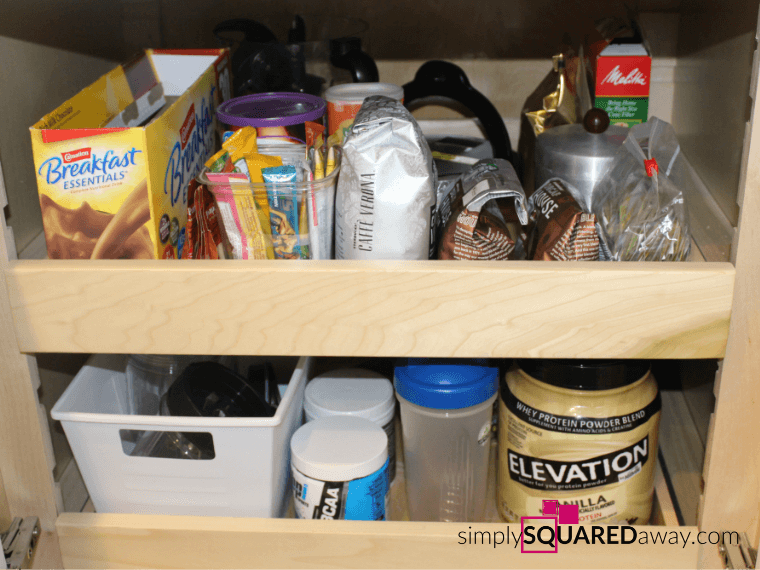 Top drawer: Snack bars, chips and other snacks in three bins. Second shelf: Oils and syrup in the black bin. 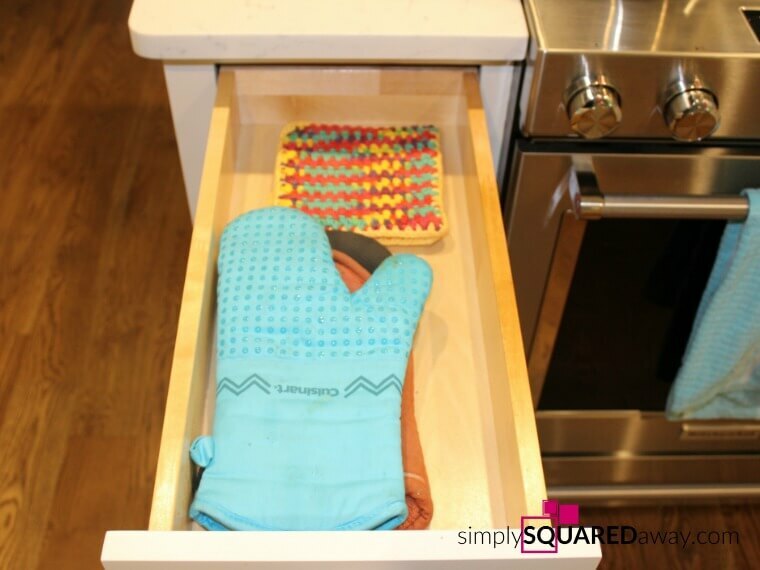 I like to keep these items in a bin so they don’t get the drawer oily or sticky. On the left is all my healthy foods in jars. I’ll show an organizing post on this later. Third drawer: Grains and pasta. 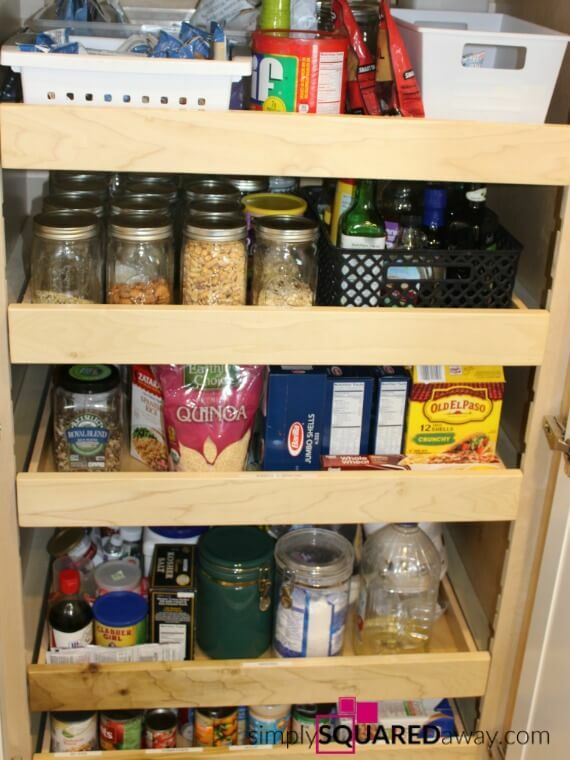 I adjusted these shelves, also, to make room for a tall container of oatmeal and canisters with baking ingredients. This is my absolute favorite cabinet. Everyone needs one of these. My cabinet guys custom built this one to look like the picture I gave him of my mother-in-law’s cabinet. 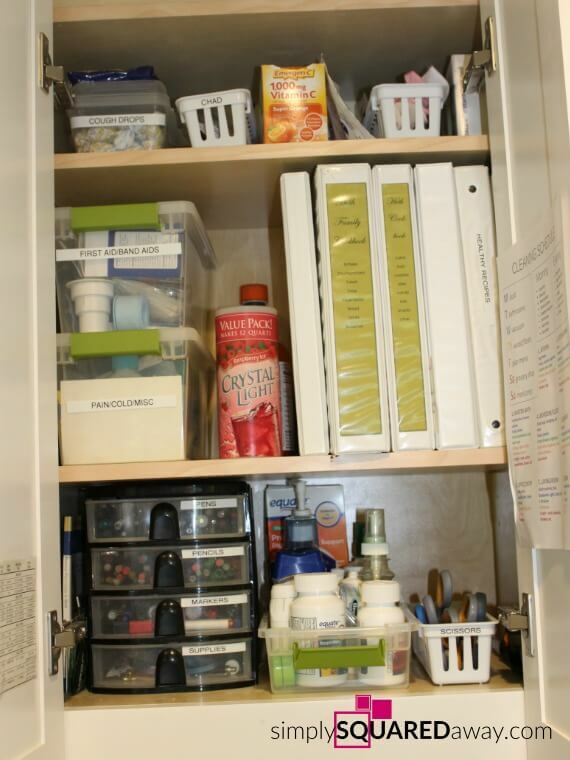 If you don’t have a custom-made one you can buy these organizers and make one. 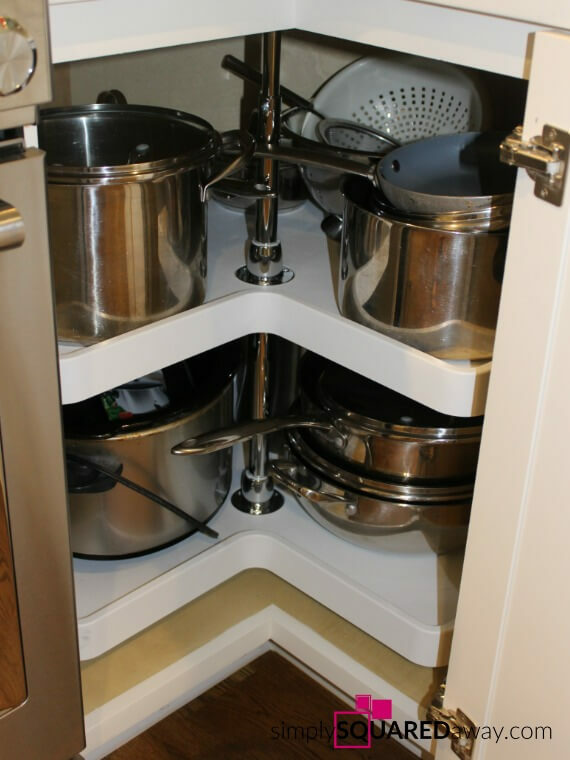 Trays, cookie sheets, muffin pans, 9X13 pans, etc need a home like this. Don’t judge. 🙂 Canisters do not work for us. We never buy the same kind and I don’t like refilling them. 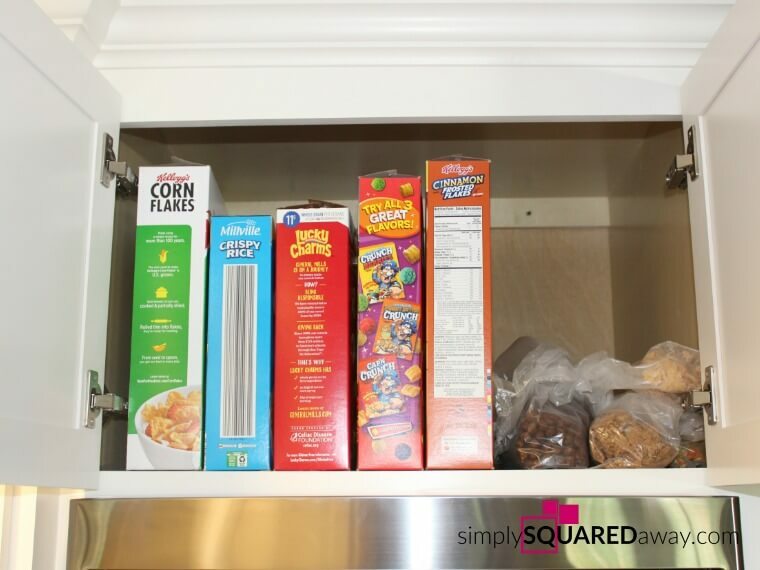 Plus, more cereal fits with just the bags and boxes. 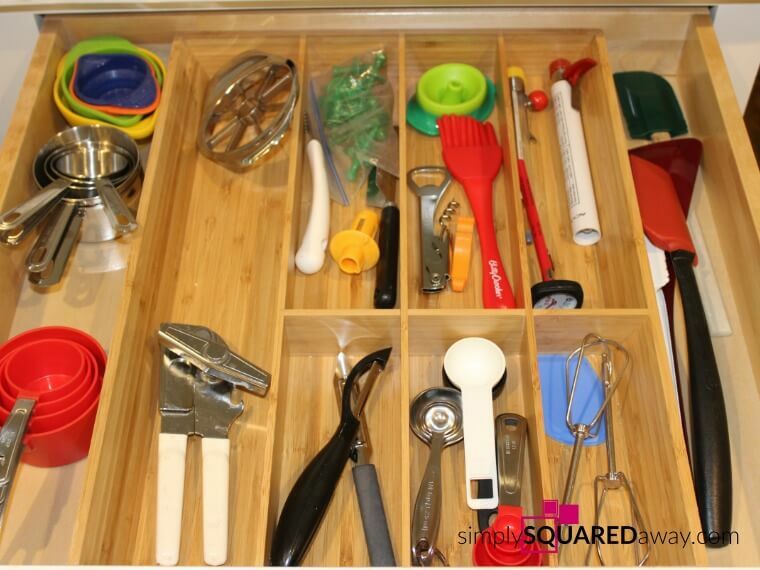 I use these drawer dividers and this thing to organize this drawer. 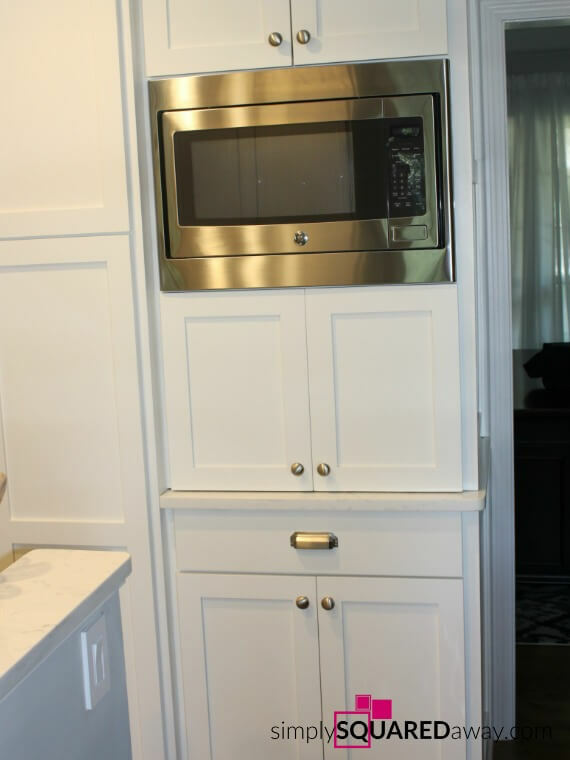 The cabinet below the microwave is for beverages. The top drawer is all teas, coffees, and mixes. It holds parts for my Ninja also. The bottom rollout is for shakes and smoothies. Smoothie cups, blades and lids are in the white bin and protein powders and shaker cups are in the drawer. 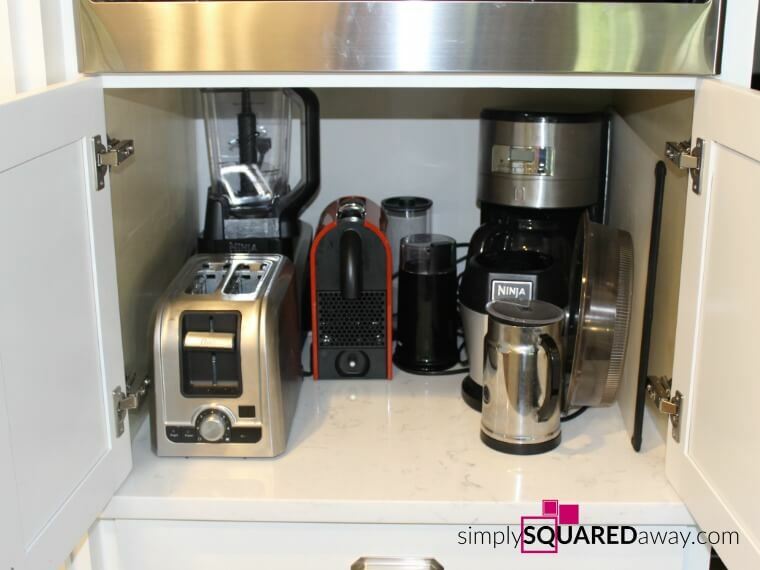 When deciding on cabinets versus drawers we decided on all lower drawers except this one beverage cabinet. I wanted to try roll outs based on the recommendation of our cabinet guy. If I had to do it over again I’d do drawers. With this cabinet, I have to open both doors first and then slide out the rollouts. Because the sides are lower things can tip over. I would recommend going with all drawers. 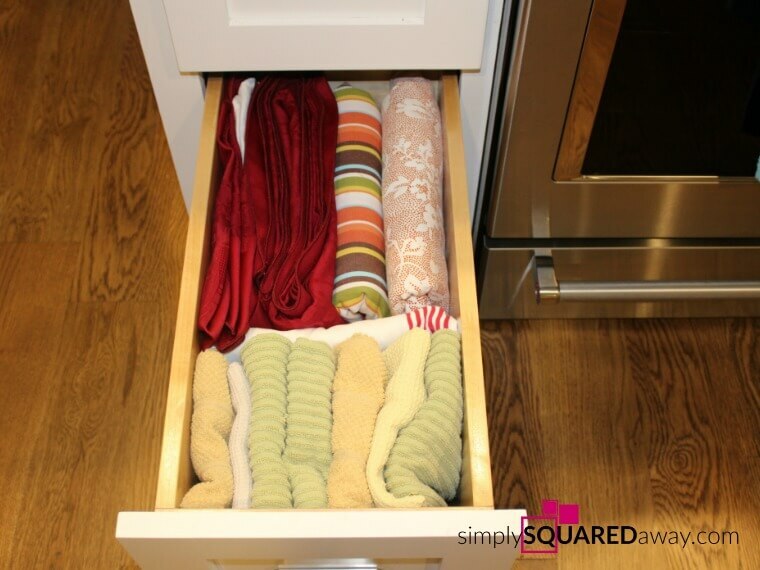 I LOVE my drawers! 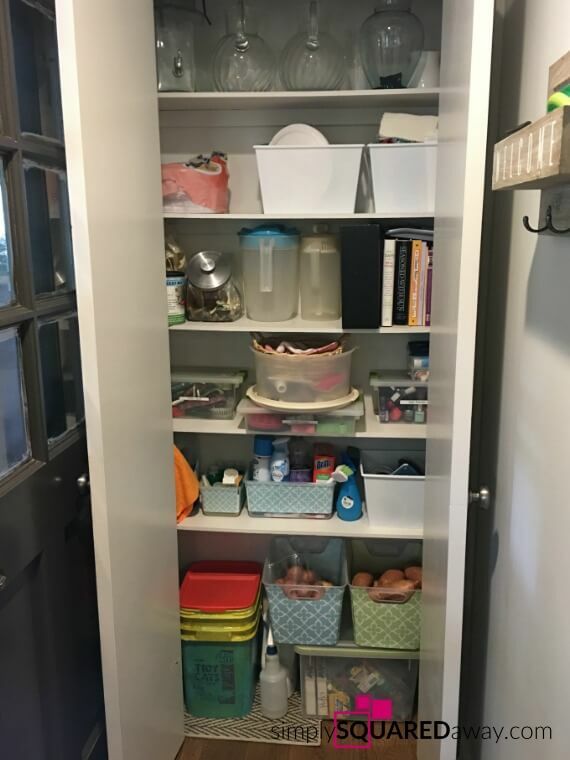 We have one closet by our back door and it holds all the rest of our kitchen stuff. Top shelf: Pitchers and vases. 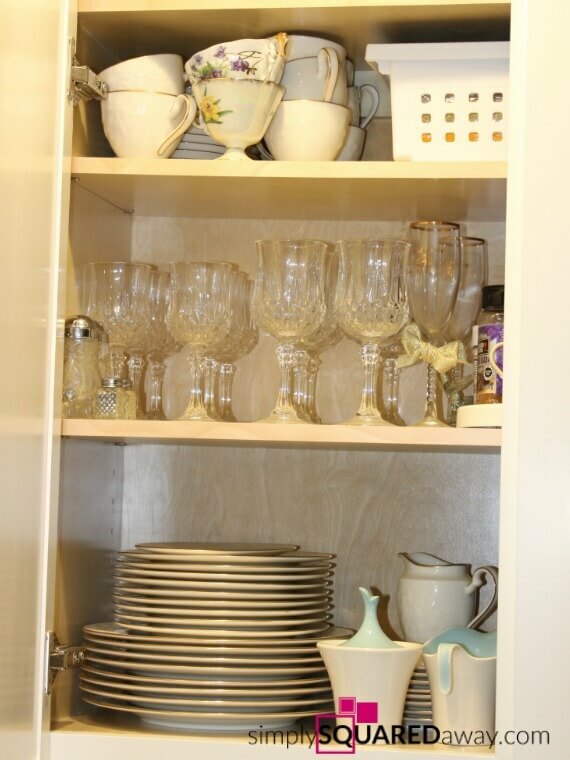 Second shelf: Paper products – plates and napkins (organized with white Dollar Tree bins). Third shelf: Pet treats, plastic pitchers, and cookbooks. Fourth shelf: Dog supplies, cookie cutters and cake supplies, and nail polish. Fifth shelf: Cleaning supplies, floor sliders and felt pads. Floor: Dog food, potatoes and onions (wow, I need to use those! ), and crafts. When my kids were younger we had a lot more crafts. They are now reduced to that one bin. The colored bins were from Target a while back. 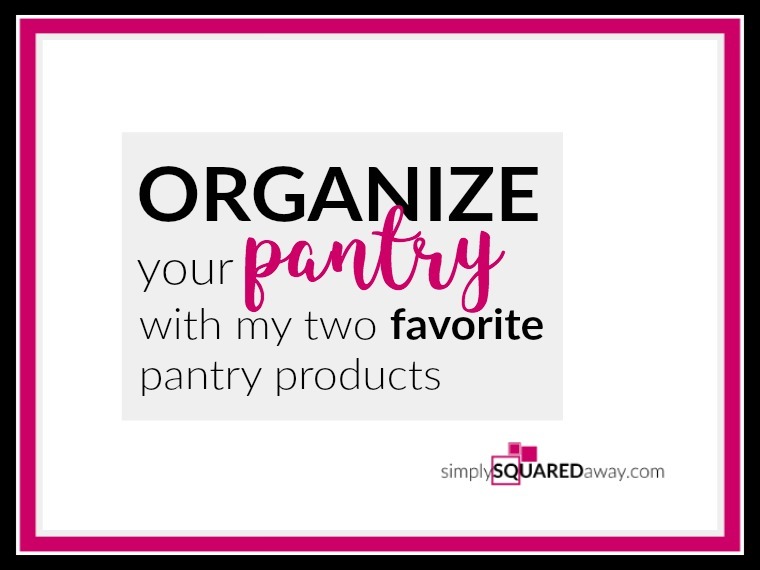 We use the top of a stand up freezer in the garage and one shelf to store extra bulk items like cereal, a case of green beans, and the double packs of syrup, peanut butter or salsa that I purchase at Sam’s Club. Extra paper products are stored in our laundry room upstairs. 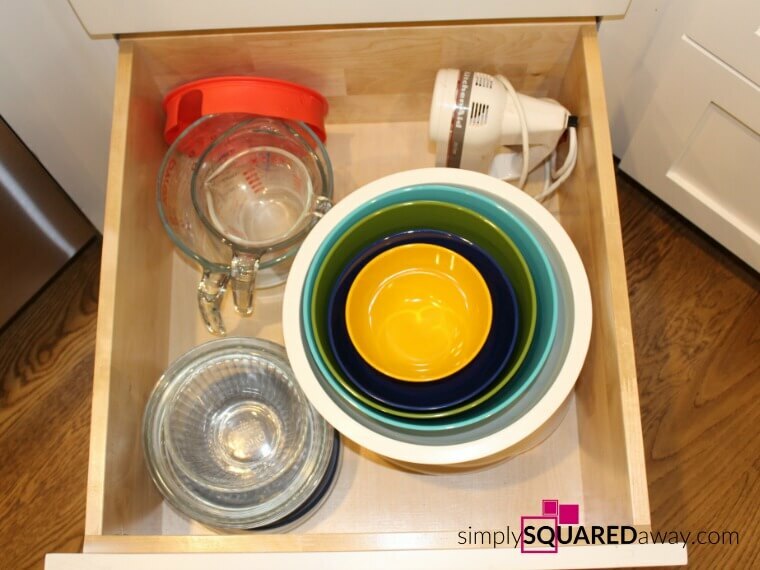 That’s how I organize my kitchen! 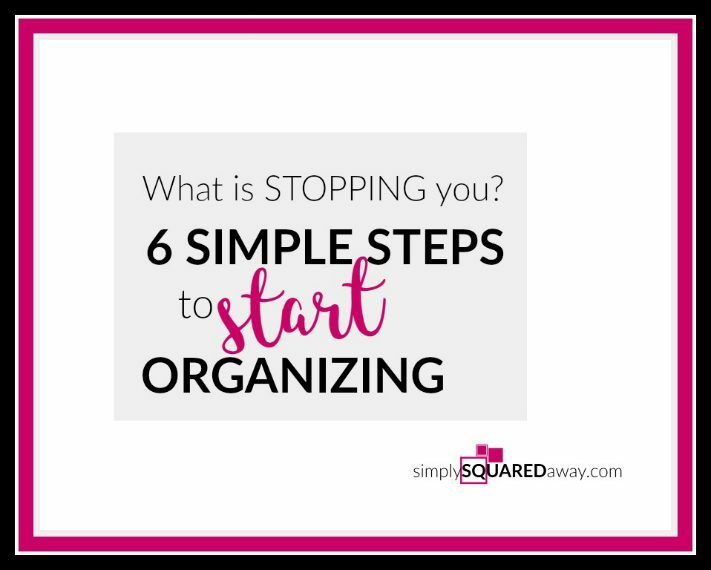 I hope it inspires you to organize an area in your kitchen or purge some things you are not using. 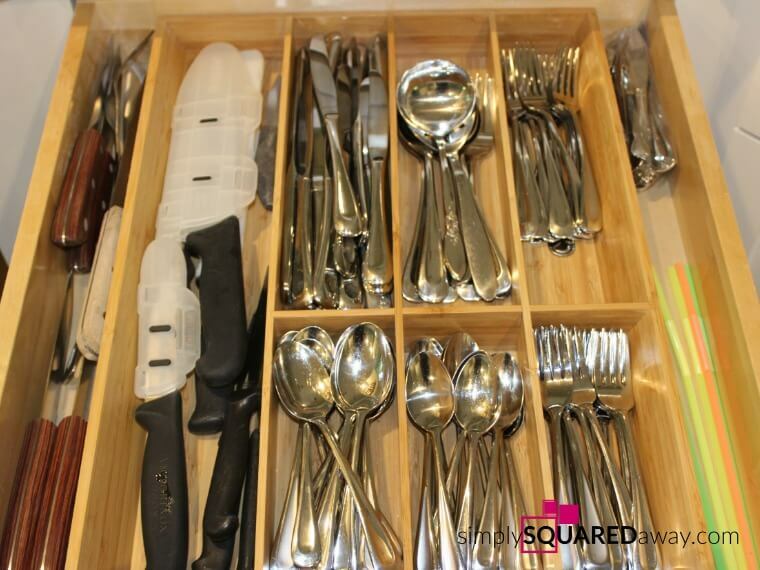 Share your biggest organizing challenge in your kitchen in the comments below. Gorgeous Tracy! Thanks for sharing. 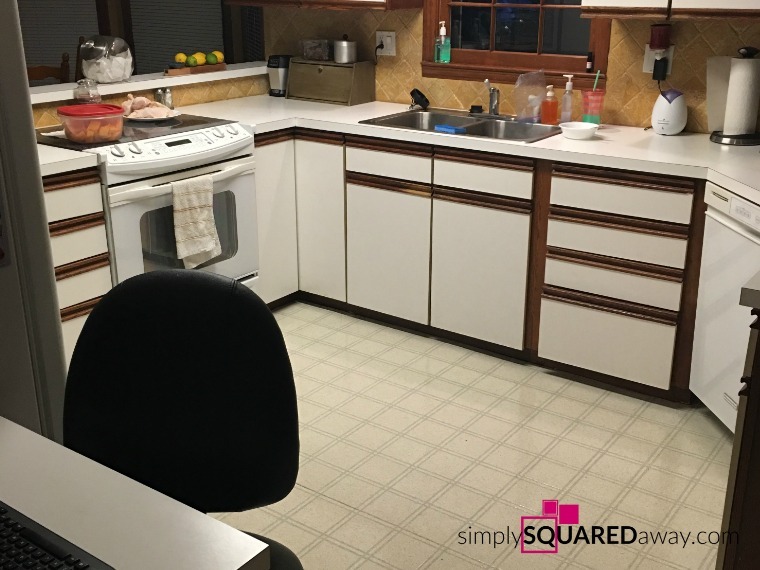 The before pictures show a dramatic change. No more raw chicken! Thanks, Jill. During the remodel it seemed to take forever. But looking back it was only 4-5 months!